“Social Media is not about technology. It is about conversations enabled by technology.” I used this quote, which can be found in many presentations, in a recent social media presentation I gave at CIAT. Technorati is a good site to start searching for related blogs. What are your first reactions to the practice of social media listening? What would it take to make this a permanent and strategic activity? The second edition of the KS Workshop is currently kicking off with a “Week Zero” which is dedicated to introductions, and orientation around the online space of the workshop: Moodle. Week 0 has been added by the facilitators to the workshop agenda. 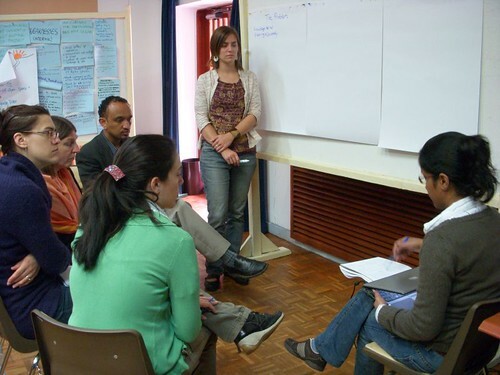 We hope that it helps to give the group more time to get ready for the workshop – a need expressed by the participants of the first edition of this event, held between April and May 2008. Tomorrow a first conference call will provide an opportunity for a workshop orientation: expectations, overview of the agenda and a “Moodle tour”. This week I have been attending the Face-to-Face part of the Knowledge Sharing Workshop at ILRI in Addis. The F2F part builds upon a month of online discussion on KS tools and methods. Today I had the opportunity to benefit from the collective knowledge of colleagues working at various CG institutions, FAO and FARA and at the same time, learn about an extremely useful KS Method called Peer Assist. We started off the session by watching and getting introduced to the Peer Assist Method. As we were more than 10, we were divided into two different groups. As a Peer Assistee, the person or team facing a challenge or problem, I had the opportunity to discuss the issue of getting buy-in from the Staff members of the Rome-based agencies (Bioversity International, IFAD, FAO, WFP) to participate in the upcoming Knowledge Fair. The discussion was facilitated by Vanessa. During the first group discussion, I had the opportunity to detail out my issues and gather feedback from the colleagues. Once we finished the first session and moved to the second, the task of explaining the problem seemed much lighter. I detailed out the problem, refining it slightly based on the feedback I received in the first group. Vanessa then read out the points we had gathered from the first discussion. Because we already had covered some of the ideas, the participants felt that in the second round, they had the opportunity to build-on the ideas and give additional suggestions. Involve staff from different departments from participating organizations who are currently doing activities that demonstrate knowledge sharing. I thought the role of the facilitator was crucial in ensuring that the discussion stayed on track and that important points were well captured. More information on the Peer Assist Method is available from the KS Toolkit Wiki.